Community gardening builds community through agriculture and shared place. Historic preservation builds community through shared meaning. Both facilitate the observer, visitor, gardener, to cultivate their own sense-of-place. Both tie cultural landscapes together. As anew member of the Garden City Harvest team, my past in historic preservation has lent me an appreciation of the local place and a specific lens in which to view our mission. Yet, this organization has taught me more – – GCH has taught me the many other ways of building community, and most importantly, it has cemented my belief in the solace of shared place. Whether a green garden or a defunct industrial ruin, both serve as reminders of community, and undergirds the process of place-based progress. Both bring us all together. Little did I know when rambling 15 months ago that the notion of historic preservation would become such a vanguard within the Garden City’s communal conversation. Even less did I know that co-coordinating Community Gardens would lead me directly back into the world of building community through historic places, and that the lessons I learned while sowing seeds with my fellow community members would prove my previous romantically concocted notion, that a special union exists between old places, green places and shared places, to be inextricably true. That when value is cross-pollinated amongst these places, the collective strength of a community thrives: historic preservation and community gardening both serve to construct place through interaction with our local landscapes. Illuminating the subtle nuances that make Missoula special, narrating our collective story, fueling the fire for which we choose to protect this city, progress this city, and respect this city. Thank you Garden City Harvest for not only building community, but for believing in and celebrating this very special place we live in. Why is the Garden City named the Garden City, after all? Here’s why: because Missoula is so goshdarn dreamy that’s why. No, just kidding, not really, but no. Much debate surrounds the origin of the Garden City. Some say it was termed due to our relatively mild climate compared to the rest of the state, and thus its delightful environs for habitation. Some say that Missoula became the Garden City as it was known across the region for its boulevards with mature trees and purposely landscaped median lanes – a practice we’ve lost with the onset of traffic, but one which will hopefully make its way back to the Garden City. Others say that it’s due to the fertile Bitterroot Valley, and the quick, widespread and easy settlement of farming. Although this area was originally named “Nemissoolatakoo,” a Salish word from which Missoula is derived, our charming slogan commenced, like the majority of development in the American West, after the Northern Pacific Railroad laid ties along the Clark Fork in 1883. With it came the usual flurry of development; city infrastructure, trading, industry and of course, farming. What sets Missoula apart from growth in other western towns is the succession from traditional style farming, with sprawled fields located outside the urban core, to subdivided and incorporated farming communities located within the Missoula urban core. The planned incorporation of “rural” living spaces, platted and added as a city addition, articulated farming and gardening as a major character defining trait of the community. In the late 1800s, farmers and developers alike realized that Missoula’s soils were, despite the short growing season, especially conducive to growing, as Missoula quickly became the main supplier of farmed goods to lumber and mining towns across the region. As Missoula expended across the Clark Fork and to the south, land owners sought the opportunity in developing Missoula’s first intentional community. Orchard Homes was subdivided along the south bank of the river and marketed with the sole purpose of family farming and gardening. In 1900, Samuel Dinsmore and R.M. Cobbin purchased 640 acres near present day 3rd Street and Reserve for $1.25 per acre. They subdivided the area into properties of about five to ten acres in size, which initiated the development of “gentlemen farms,” or “farmettes.”Shortly thereafter, an irrigation ditch was built and the land in the new Orchard Homes area was sold for $100 to $300 per acre. In total, 300 irrigated 5-10 acre tracts were individually farmed and cultivated between the turn of the century and the 1980s, when newer development and single and multi-family homes began to fill in the once open landscape. President Teddy Roosevelt believed that rural America was the ‘backbone of our nation’s efficiency,’ but that rural life risked being left behind in the modern America emerging in the first decade of the 20th century. In 1908, he formed a Commission on Country Life, headed up by Liberty Hyde Bailey, to investigate ways of making country life more attractive. The 1909 Report of the Country Life Commission highlighted a list of “deficiencies” in rural life that were prompting people to leave the country for the city, but had few concrete recommendations for remedying the situation. One hundred years later, just about all of those “deficiencies” still plague rural America, and people are still leaving country for the city. Despite its apparent lack of results, however, the Report remains a landmark for the attention it brought to issues of country life, and it remains an inspiration for our Rural West Initiative. Although the Country Life Report may have failed in enacting change in other locales around the country, Missoula took it in stride, and even exemplified remedies that the report otherwise fell short in advancing. 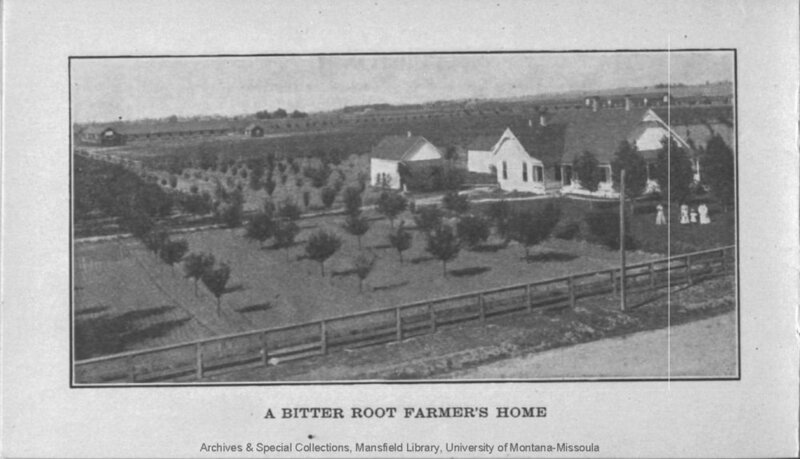 In 1911, following the Country Life Report, and in conjunction with the success of Missoula’s farmettes, the ladies and gentlemen farmers enacted the Orchard Homes Country Club, “with the purposes of providing a community center, mutual welfare, and a better rural environment for its members.”  Members of the club were able to volunteer as local firefighters, advocate for Women’s Suffrage, and generally promote civil and community service on a local level. Photo courtesy of Archives and Special Collections at the University of Montana, Maureen and Mike Mansfield Library. In addition to gentlemen farming, rural advocacy and providing goods to the region, the Bitterroot was on the forefront of agricultural showmanship with the advent of the McIntosh Red Apple. The McIntosh helped the area develop a wider scale of export and recognition – but I’m getting a little off point, read more about our historical relationship with the McIntosh Red here! University buildings at the base of Mount Sentinel as seen from Mount Jumbo. Hughes Gardens are in the foreground. Missoula, Montana, 1901. Photo courtesy of Archives and Special Collections at the University of Montana, Maureen and Mike Mansfield Library. “Missoula is at the head of the Bitter Root Valley, long celebrated for its fertility, and for its possi­bilities in the way of horticulture. Bitter Root Valley apples have long been famous, and it is expected that this year there will be over 200,000 boxes or bushels of apples shipped from this valley to the eastern market. 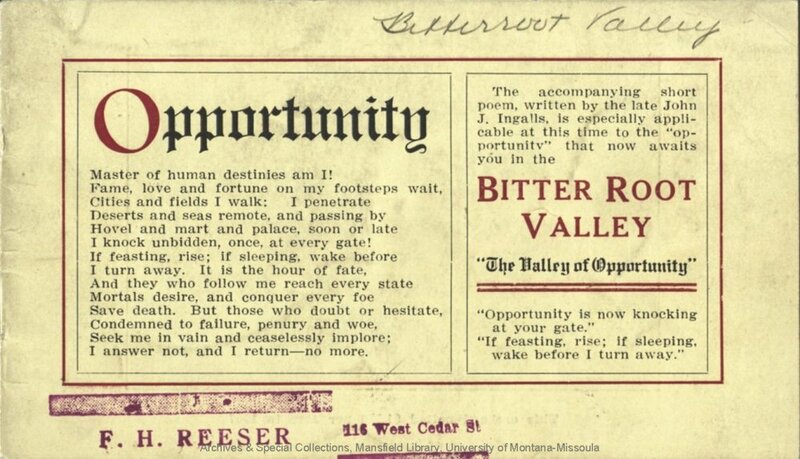 Missoula, Mont., Oct. 9, 1901. Dear Sir.—I have just harvested the last of my Orchard Home crop. Had you told me a little over a year ago, when I made my purchase of ten acres, that I would realize in dollars and cents the amount which I have this year, I would not have believed you. My crop and profits this season have been enormous; I will clear over $1,000 on seven and one-half acres, two acres of cabbage alone bringing me $400. I know of no land anywhere that is so admir­ably suited to the raising of fruit and vegetables as that obtain­able in the “Orchard Homes.” I am more than satisfied with my investment and know of nothing which brings the return on the money invested which an Orchard Home tract will bring a man who will tend it properly. I will freely give the result of my experience and success to anyone who will call on me or write me, feeling in so doing that I will be conferring a lasting benefit on him if I can interest him as I have been interested myself. To: Samuel Dinsmore. Missoula, Mont., Oct. 8. 1903. Dear Sir. I do not believe that there is a property owner in the Orchard Homes who can so freely and justly express his views regarding the fertility and productiveness of the soil as the under­signed…. Thus became the Garden City forevermore. Yesterday, Garden City Harvest unveiled the public phase of building its new farmstead with an official press conference. The farmstead is located at the River Road farm, and will include a new farmhouse style office and community barn space. More specifically, the new home of Garden City Harvest, whose motto once stated, “putting the gardens back in the garden city,” is located on one of the original tracts of land platted within Dinsmore and Cobbin’s historic Orchard Homes. Although the majority of parcels within this plat addition have been further subdivided and developed into single and multi-family homes since the 1970s, the River Road Farmstead will now serve as a vestige, harkening to a time when the land was devoted to farming, the very land which constructed the identity of Missoula as we know it. Garden City Harvest is now joining our forefathers who sowed the same land, those advocates for the rural west, apple farmers who put the Bitterroot region on the map, and initial community builders through agriculture, over 100 years ago. P.S. – Check out the Montana Memory Project for more historic photos and documents about Missoula! Make it Missoula, “History of Missoula, MT,” Make it Missoula, last modified 2017, accessed May 10, 2017, http://www.makeitmissoula.com/community/history-of-missoula/. Stan Cohen, Missoula County Images II (Missoula, MT: Pictorial Histories Publishing, 1993), . “Orchard Homes Country Life Club Records, 1906-1994.” Archives West, last modified 2011, accessed February 29, 2016, http://archiveswest.orbiscascade.org/ark:/80444/xv94555. Stanford University, “Teddy Roosevelt’s Country Life Commission,” Rural West Initiative – Bill Lane Center for the American West, last modified 2012, accessed May 10, 2017, http://web.stanford.edu/group/ruralwest/cgi-bin/drupal/content/country-life-commission. Irrigation in Montana (n.p. : Northern Pacific Railway Company, 1904), .